Happy New Year! Every year growing up, my mother would always fix black eyed peas for good luck. There have only been a few years where I haven’t had them….one such occasion was in college when I was broke down in Texas while on my way to the Orange Bowl. I settled for a bean burrito….I figured beans of any type would work. I think my car got stolen that year. 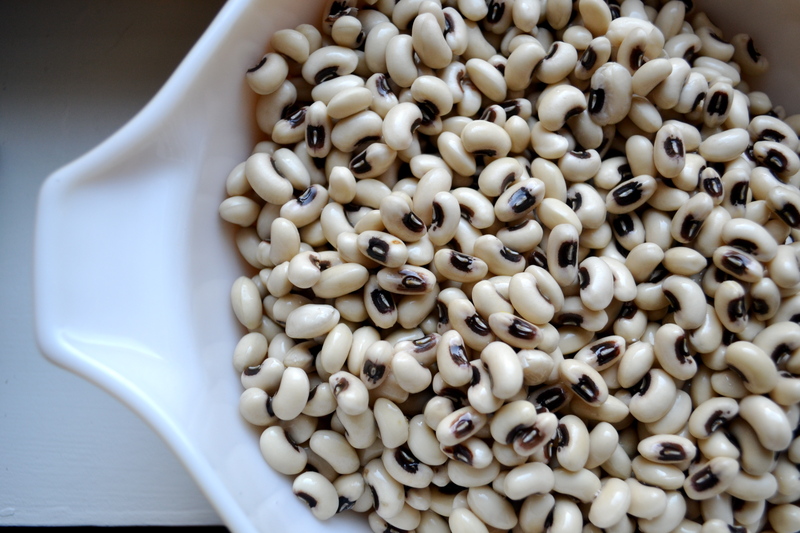 So moral of the story….eat your black eyed peas people! 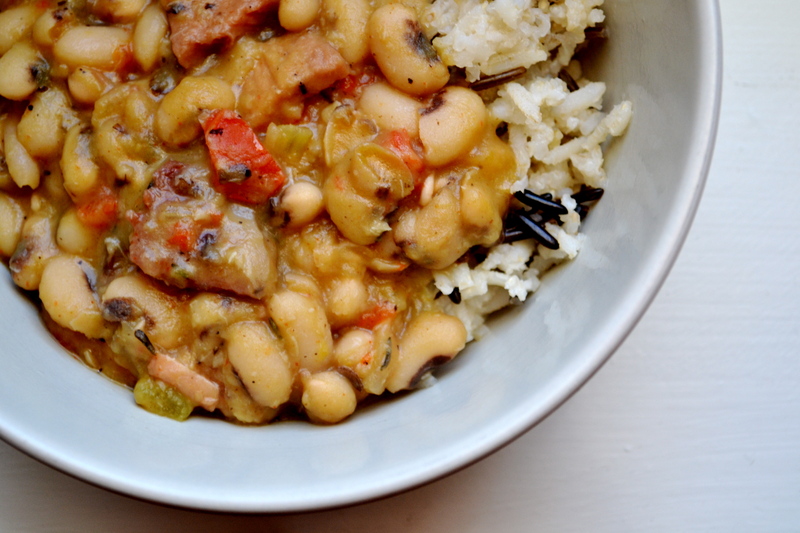 So, in keeping with that tradition, I make Hoppin John, which is a fabulous spicy black eyed pea and ham dish served over rice. My other tradition is to stay home and in my pajamas. So far, it has been a successful start to the new year. In a large Dutch oven or kettle, heat oil and add the ham hock and sear on all sides. 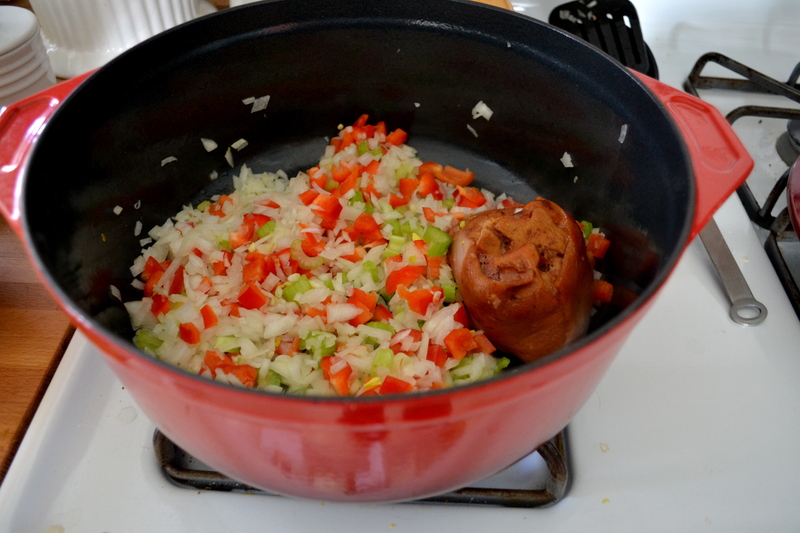 Ad the onion, celery, bell pepper, and garlic and cook for 4 minutes. Add the soaked black-eyed peas, stock, bay leaf, and thyme. Bring to a boil, reduce the heat to medium-low, and simmer gently for 40 minutes to an hour. If you don’t soak the beans overnight, you can add unsoaked beans to the pot but will need to cook for 2 to 3 hours. Peas will be creamy and tender. If liquid evaporates, add more water or stock. Remove the ham hock bone and cut off the meat. I usually add leftover ham from the holidays that I freeze. Using the back of a wooden spoon, mash some of the peas against the side of the pot until the stewed peas have some body (slightly thick). Add the cayenne, salt, and pepper to taste. I like to top this with tabasco and green onions. Serve over brown rice. For Rice: Add 2 1/2 cups of water and salt to a medium pot and bring to a boil. Add 1 cup of long grain brown rice, cover, and lower heat to low and cook until the rice is tender, about 20 minutes.